Have you ever seen really well done bullet journals or just great hand-written journals in general? They’re amazing, but I don’t know where people find the time to put so much effort into, well, planning their time. I might just be too lazy, if I’m honest. Either way, when I wanted to really start getting my meal planning organized, I considered an analog planner. But I found, instead, an online way that makes sense for my brain and makes it dead easy to move things around and keep track of notes, links, and images. I tried out the online app Trello, which so far has been perfect. I plan on using it for all facets of planning, but so far it’s been mostly for meals. But it’s been a great way to learn how to optimize it and I have been rolling it out into work, finances, etc. slowly but surely. 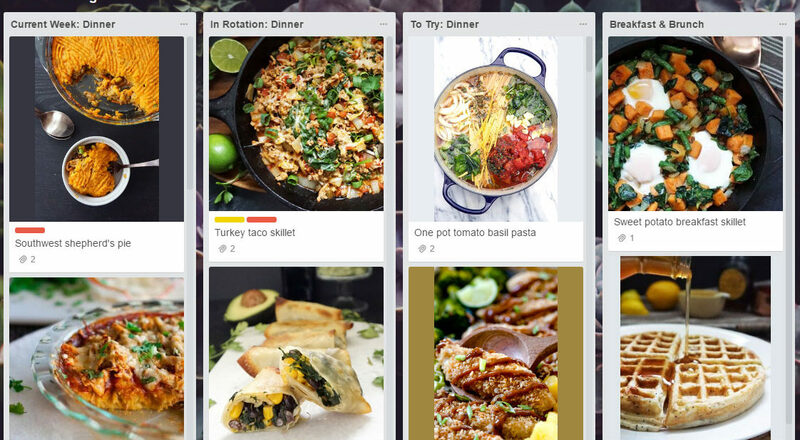 The gist of Trello is that you can create high level “Boards” which allow for “Lists” within the boards, and under that, “Cards.” So I have boards for meal planning, creative projects, work tasks, larger projects, finances, and home stuff. But we’ll focus on meal planning for now. Under each board are lists and each list can contain as many cards (to-dos, or in this case, recipes) as you like. 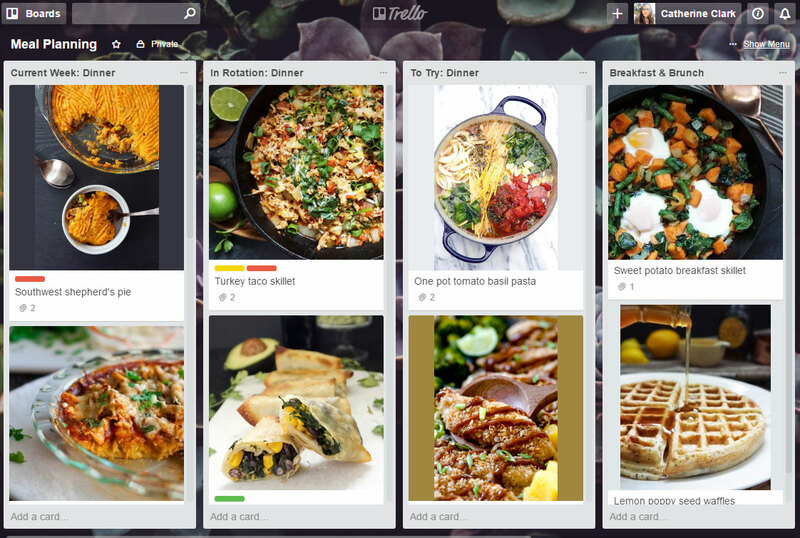 The cards can contain photos, links, and notes for each recipe. I love the notes feature because I can jot down changes to the recipe or storage notes, that kind of thing. The biggest list under this board is the “in rotation” list. All meals that make the cut (ie. they’ve been made, eaten, and want to be eaten again) get put into this list. Once it’s been made, it gets tossed to the bottom of the list. 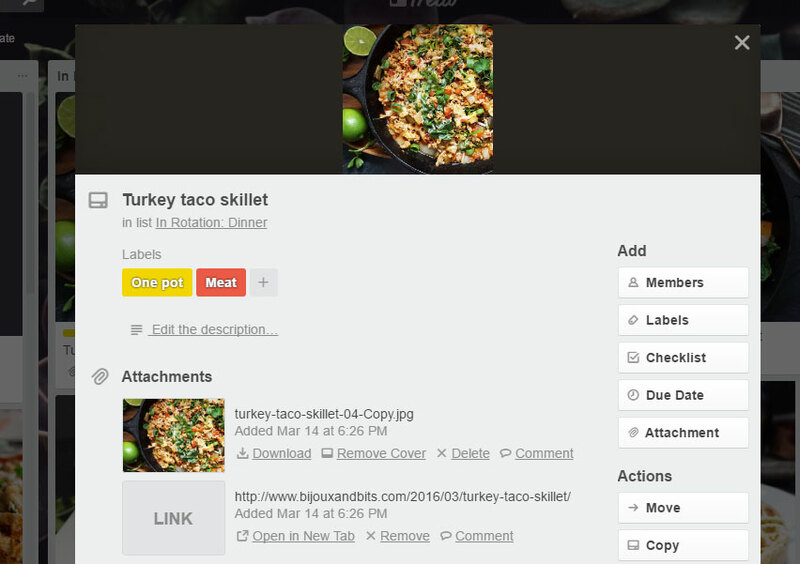 You can create a card for each recipe, and then just slide it down the list by dragging and dropping. Easy peasy. Another great way to keep recipes organized is by giving them labels. You can assign names to colors (say, green for a vegetarian meal), and apply the labels to the card. Turkey taco skillet = one pot and meat labels, for instance. I like to keep the week balanced between meat/no-meat, one pot, slow cooker, store-bought, etc. This helps me manage the budget easier, too, since I can toss in a veggie meal or a slow cooker meal to save some cash. Weekly meal planning can be a bit daunting, especially when you’re living with someone for the first time and are trying to figure out how to make a meal budget stretch and not be boring and repetitive. I’d love to hear what methods/tools you use to meal plan! Mostly I do my meal planning right before my shopping. I use what I call “the rule of two” which means I can’t have more than 2 meals plans planned. Sounds crazy, right? I should probably also point out that a “meal” is a lunch/dinner thing that I will eat over several days. I keep rotating stock on hand for breakfast and snacks ( string cheese, fruit, yogurt, eggs, tomatoes, etc ). It’ll take me about 5 days (or more!) to eat this food and I’ve found that if I buy ingredients for more than 2 meals, the third one doesn’t get made before the ingredients go bad. So : two. I also keep a list on my phone for menu ideas which can be new dishes to try, dishes that I want to serve to company or dishes that didn’t make the “rule of two” cut this week.. so maybe next week? I’ve tried writing more detailed weekly menu plans but, eh, I can’t stick to it. Yep, that rule of two makes perfect sense to me. When I lived alone, it was basically the rule of “one meal per week that I would get very sick of.” 😉 But it was efficient! What I really need in an app is something that will allow me to pick a recipe, make necessary dietary changes to it, draft a grocery list based on that, and then give additional meal suggestions for leftover ingredients (leftovers we have for lunch, generally, but if I buy an entire ham, I get to the point where I don’t know what to do with half of it- and some things you can’t get in one-meal portions). Or maybe I just need a personal chef…. This is genius! Thank you for sharing. I can’t wait to test this out on Trello. This is great! 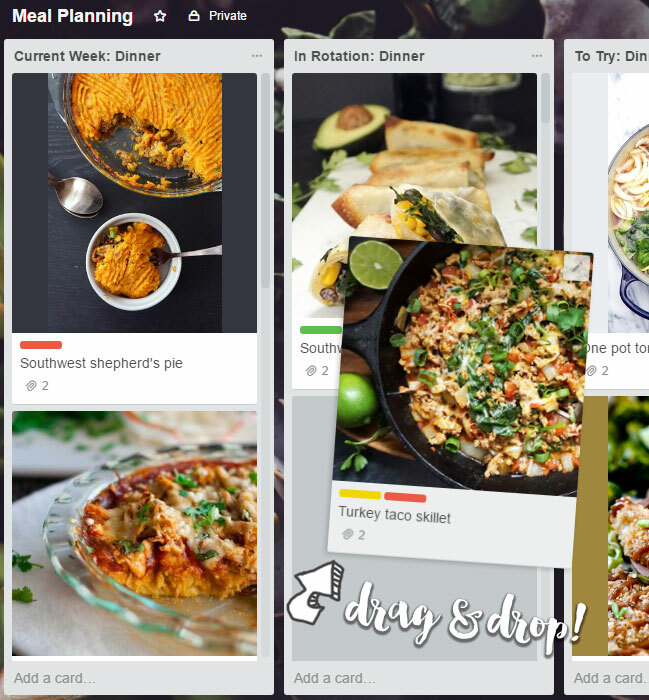 I use Trello for everything- work, life but I have been struggling with how to meal plan in general and how to set it up in Trello. This gives me a lot of great ideas, thank you!